The CFS Foundation will secure new and continued levels of philanthropic support from a diverse donor constituency through a variety of gift and investment opportunities. This support will be invested in a prudent and responsible manner to fund the on-going operations, capital expansion and strategic growth of The Center for Family Support New York, Inc. and The Center for Family Support New Jersey, Inc. The CFS Foundation will conduct our fundraising with the highest degree of integrity and fiscal accountability, serving as responsible stewards of the relationships with and contributions of our donors. We will strive to exceed donors’ expectations, by minimizing expenses and maximizing the positive impact that each gift has on the lives of our service recipients. At The Center for Family Support, we put our service recipients first. Every one of our Direct Support Professionals, Residential House Managers and Community Habilitation staff are driven to provide our service recipients with innovative, compassionate and effective care. That is why CFS has been awarded the four-year Person-Centered Excellence Accreditation, With Distinction, from CQL, The Council on Quality and Leadership. 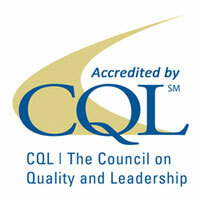 The Center for Family Support becomes the first agency in New York State and only the ninth in the country to be accredited by CQL with Person-Centered Excellence with Distinction. A tribute gift is an extraordinary gift to say thank you, recognize a job well done, remember the passing of a loved one and celebrate an event. This is a gift that touches the heart, while it touches the lives of our service recipients and their families. Corporate and Foundation support is vital for The Center for Family Support to develop creative solutions and opportunities for those participating in our programs. Transformational Gifts or major gifts help transform the care we provide by supporting urgently needed programs, capital projects and community outreach efforts. Make a bequest, establish a charitable trust or annuity or include The Center for Family Support in your will. The mission of The Center for Family Support Foundation is to support the incredible programs and services of the organization. When you make a donation, you give a gift that impacts thousands of individuals with developmental and other related disabilities. Your donation makes it possible for our service recipients to receive the care and program support they need. We encourage you to explore the ways you can get involved, and make a difference today!